Palmako Hanna 14.1m² Summer House features 1 double door and 4 double glazed windows ensuring the space is light and airy but warm in the cooler seasons. 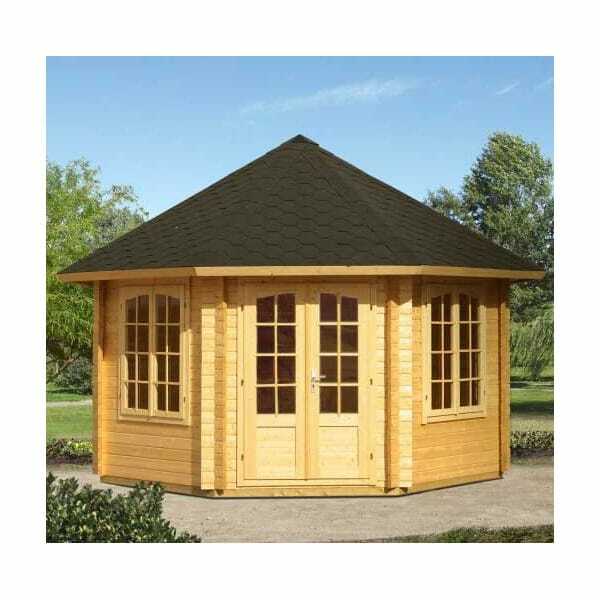 A very impressive octagonal summerhouse with a log cabin feel owing to its superb quality. If the summer house is to be assembled in a restricted space; there should be an allowance made for roof overhang to the both sides and rear of the building of 35cm roof overhang. Please Note: In common with most outdoor buildings, this summer house is delivered untreated and will require the application of a good quality timber preservative. Showing our 2 Palmako Hanna 14.1m² Summer House Log Cabin reviews with an average rating of Excellent. Would you like to write a review?